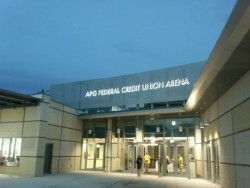 The APGFCU Arena at Harford Community College is the largest indoor venue in northeastern Maryland. The arena seats 2,500 in stadium seating and 3,200 with floor seating. It is the home of Harford's Fighting Owls men's and women's basketball and women's volleyball. It also will host community and regional events, commencements, concerts, conferences and trade shows.